Marc Anthony bye.bye. 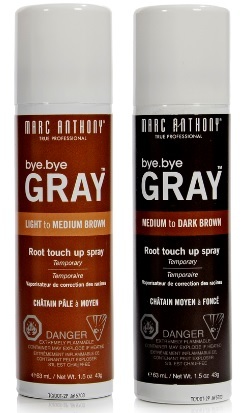 Gray Root Touch Up Spray - instant coverage for those gray days! Marc Anthony bye.bye. Gray Root Touch Up Spray - 63ml - $12.99 - a lightweight, fast drying, colour matched, temporary spray that instantly covers up gray roots in seconds to buy some time between colouring and lasts until the next wash. This lightweight spray bonds to gray hair to help instantly blend and camouflage, dries in just seconds without a heavy buildup and is colour matched to all shades of light to medium brown or medium to dark brown so it looks completely natural. With a targeted application nozzle that helps to achieve extra precision when applying and easily washes off with the next shampoo.